DRINCURRY is full of spices. Drink it every morning for your health – and for the hot new taste! 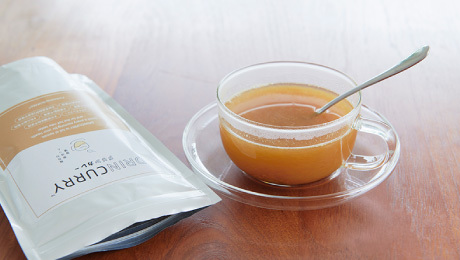 Drincurry is a new type of hot drink. Just like instant coffee, you simply add water. 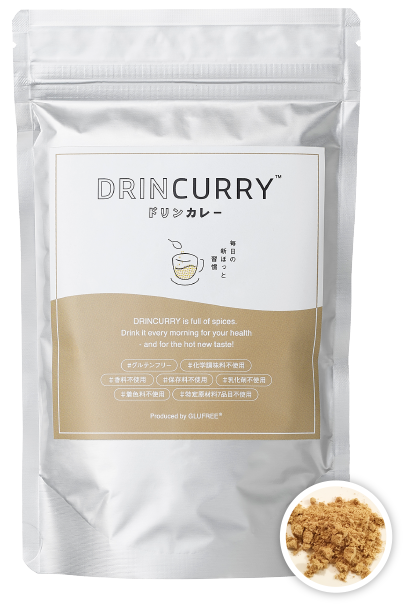 Drincurry is a way to drink spices, bringing warmth into your everyday life. eggs, gluten, milk, prawns, crab, nuts and buckwheat. The idea to create a curry drink came from drinking hot water every morning from a traditional iron teapot. Spices have numerous health benefits. So we wondered what it would be like to add spices to hot water. Perhaps adding a curry taste would make hot water tastier and more nutritious? We thought it should be a taste that everybody would like: men and women, the young and the old. So we drank various samples every day in a search for the kind of drink we had imagined. The final result, Drincurry, combines more than 15 spices. 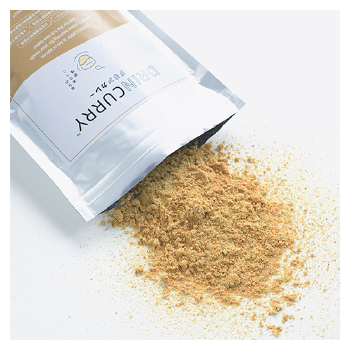 Drincurry is made without additives such as chemical flavour enhancers, preservatives and artificial colouring. It contains none of the seven major allergens. In particular, it is made without wheat flour, so it is gluten-free. 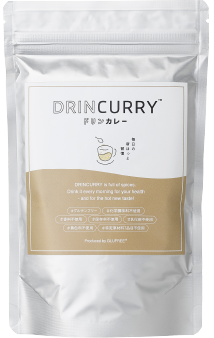 Try making a cup of Drincurry part of your everyday life ! 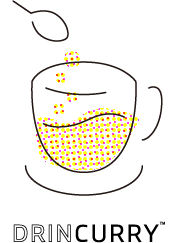 Put 5 g (about 1 heaped teaspoonful) of Drincurry in a cup. Add 150 ml of hot water. Mix thoroughly. Your Drincurry is ready to drink! For children, Drincurry can be mixed with milk or soya milk to make a mild curry drink. 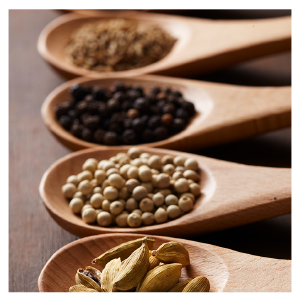 Spices have been used since antiquity in traditional Chinese medicine. They come in a vast number of varieties and have a range of effects. Drincurry combines more than 15 spice varieties in a precise balance. We recommend drinking a cup a day to get the most out of its benefits for health and beauty. Recognizable for its unique scent, it has drawn attention for its detoxifying properties. Rich in vitamin C, calcium and iron. Has a mysterious, bittersweet fragrance. One of its constituents, cuminaldehyde, boosts the metabolism and has a calming effect. It also contains limonene and vitamin E, which are known as antioxidants. One of the worldʼ s big four spices, along with cinnamon, cloves and nutmeg. It is said to boost the appetite and facilitate digestion. Rich in vitamins A and C, it facilitates digestion. Its hot component, capsaicin, is thought to boost the metabolism. But it is advisable not to eat too much because of its strong stimulant effect. Dried tangerine peel known for its fragrance. It is said to have carminative and antitussive properties and to promote the wellbeing of the stomach. Said to be one of the world's oldest spices, it is known for its unique sweetness and fragrance. Contains large quantities of calcium, iron and manganese. Called the king of fragrances because of its strong scent. Used as a spice and herbal remedy since several thousand years BC. In particular, it is used to treat oedema and other forms of swelling. Contains allicin, which stimulates the breakdown of sugar, so boosting recovery and physical strength. It is known to have various effects, so has been used since antiquity as a folk medicine. Two of its constituents warm the body: shogaol, which warms from the inside, and gingerol, which warms the surface. A hot seasoning based on chili peppers and with the addition of spices including cumin, oregano, garlic and paprika. Has a sweet, strong fragrance like vanilla and produces a numbing sensation on the tongue. It is also said to have antibacterial effects, to promote digestion and to improve circulation. The main constituent, eucalyptol, is thought to promote digestion. It is known for its subtle bitterness and cooling fragrance. Gives off a sweet, spicy fragrance. Because it warms the body, it is said to have a beneficial effect on circulation. Gluten-free, No chemical flavourings, No artificial colouring, No preservatives, No dairy products, No artificial flavourings, Does not contain any of the seven major allergens ‒ that is, eggs, gluten, milk, prawns, crab, nuts and buckwheat. Copyright © Higashi Planning Office All Rights Reserved.